In retrospect, I don’t blame myself for fangirling. It was a moment of serendipity — completely unexpected, unplanned, and straight out of a Hollywood movie. As a web journalist, opportunities to mix with the high-flying celebrities of the region are few and far in between. Yet, when I received a call from the head of reporters to fill in as an Arab speaker at the Mohammed Bin Rashid Global Initiatives event a few days before Eid, I was happy to oblige. The event organiser had replied “yes” to my semi-nonchalant query about whether His Highness Sheikh Mohammed bin Rashid Al Maktoum, Vice President and Prime Minister of the UAE and Ruler of Dubai would be there, but I thought nothing more of it. What my mind registered was not the royal presence who would be attending, but rather the fact that the event would be held at around 5.30-8pm (Iftar – therefore food!) and it would be at Dubai Opera (snazzy place where high-flyers abound). In any case, after coming to work a full eight-hour shift, I picked my clothes with the Dubai Opera in mind, lugged my four kg laptop, and took a cab in the sweltering heat to the location. Disembarking rather awkwardly, with three handbags, I was pleasantly surprised at the availability of a mini-car shuttle that took me to the red carpet. Luxurious, I thought, and clumsily made my way to the entrance. After being security-swiped and ushered through, I found myself descending the steps of an extravagantly assembled entourage all seated on round tables dotting the main opera hall. I felt out of place in the assemblage as most women were either in western attire or abayas. I had bedecked myself in a swirly, semi-formal midnight blue gown, slashed with salmon gauze panels and a sequined waist. After making my way to the organiser, who kindly directed me to the media table, I seated myself next to a youngish-looking woman and proceeded to chat. Within minutes it was clear to me that whoever was invited were mostly Arabic press. I settled in with mild interest, mostly nervous as to whether I could operate the Facebook Live feed which would capture the grand entrance of the Sheikh Mohammed at the event. Around 6.30 pm, the large screen at the centre of the stage blinked, and we were treated to the VP making his way with his body guards up the Opera House steps. Heart racing, I fumbled with my phone and suffered a mini-panic attack because, surprise surprise, I forgot how to operate the live feed. By the time it worked, Sheikh Mohammed was yards from me, and footage captured gave a hasty, unprepared feeling instead of the casual, polished look that I had wanted. Sitting down, and vowing to capture the moment of his exit with more aplomb and panache, I watched in anticipation, with the rest of the journalists, hoping the man of the hour would grace us with some words delivered in person. No such luck. But we heard the recitation of the Holy Qur’an. 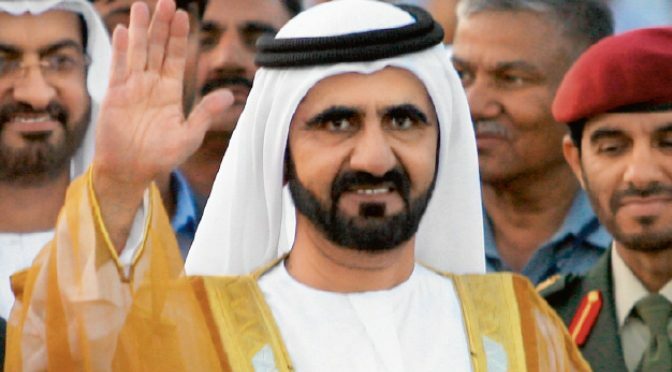 With nearly 15 minutes to go before the Iftar, Sheikh Mohammed made an about face, turned from the giant stage which featured his humanitarian works, and descended amongst the masses. The moment he moved, I fumbled yet again with my phone, caught off-guard yet determined to get the Live right. Once more, the most powerful man in Dubai, made his way down the aisle. What struck me later was the physical proximity, the opportune placing of the table, and the fact that mine was the first female face after a sea of white-donning officials and dignitaries. Keeping in mind that I had to capture his face, yet unable to get an inconspicuous camera angle after standing up in his honour, my eyes were still drawn upwards, out of my phone screen and straight into the face of Sheikh Mohammed. In the live video, you can see that the frame suddenly edits out the head of His Highness as my hands lowered, even as my gaze rose to meet his. Sheikh Mohammed’s gait slowed imperceptibly, he paused for a micro-second, shifted his stance so he was facing me, flicked his gaze to the young woman standing beside me, and then said as he looked me straight in the eyes — “Marhaba!” — and kept walking. You can hear me and my new friend murmuring “Marhaba”, as he continued his walk down the aisle without further ado. For the next 30 minutes, people at the table, around us and throughout the hall, kept giving me envious glances. My food tasted like ash, and my mouth could not unbend from its semi-crazed smile. If I had planned it, it could not have happened the way it did. Never in my wildest, most intensely star-struck dreams did I ever think my humble, two-bit self, would ever come face to face with a head of state and an international celebrity, and be the one greeted first. Later I would recollect that he used the term “Marhaba”, which is an unusual greeting for a person raised in the Gulf. The levant area — Syria, Lebanon, Jordan and Palestine — we are known for that greeting. It bewilders me to think that the great Sheikh Mohammed picked up on this fact — my origins — with a micro-second’s worth of observation — and made the automatic greeting sound so unforced and frankly, musical. Later, I would come to understand that no one else was greeted, not at least in the row of individuals that stood to greet him. And later still, I would smack myself on the head for forgetting to — or simply being too awestruck? — to have the guts to ask for a selfie with him. Needless to say, I retold the story to everyone who would give me the two minutes of enthusiastic, bombastic, ecstatic remembrance. I was envied and given accolades, laughed and marvelled at. My heart still pounds a little faster for the moment. A close encounter of the royal kind. Who woulda thunk it?